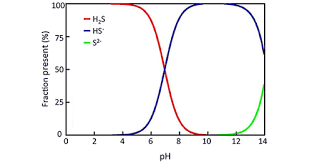 Provide ideal chemical and physical conditions such as pH and temperature to promote a shift of the constituent from water to air for stripping or visa versa for gas contact. 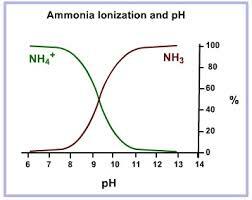 As the Figures below indicate, strip un-ionized ammonia at pH greater than 9.3, and strip un-ionized hydrogen sulphide at pH less than neutral. The greater the un-ionized portion, the faster and more complete the performance.